Students from Collegiate High School participated in this year's Trash Bash by picking up trash along the banks of Dickinson Bayou. The annual event brought together volunteers from throughout the area to clean up the bayou as part of the 26th annual Trash Bash. Throughout the years, more than 109,000 volunteers have collected 2,274 tons of trash across the state. 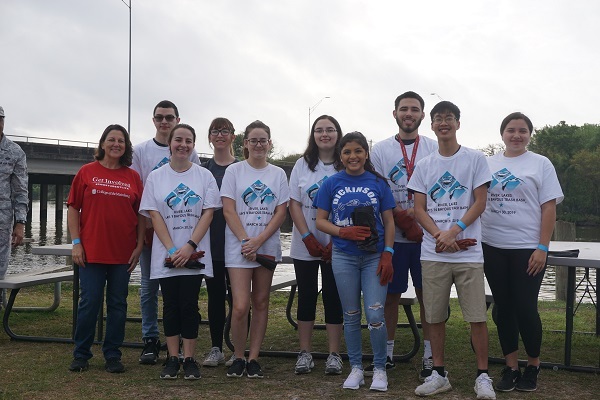 The students, mostly from Collegiate High School, were equipped with gloves and trash bags as they descended on the banks of the bayou to pick up water bottles, cans and other trash. The annual cleanup’s mission is to promote environmental stewardship. Those participating in the event were COM employees Kari Starz and Garza. Students who picked up trash were Julia Adcock, Jennifer Bahena, Tristin Benson, Mia Brown, Adrian Cantu, Josie Del Cid, Emily Hanna, Drake Hudgens, A’Nyah Joseph, Keianya Joseph, Julisa Macedo, Cadalese Ortega, Kaitlyn Robinson and Desiree Stiles.